Over time, meditation can fundamentally change the way we understand our own minds, how we see ourselves, and how we experience our connection to others and the world. Meditation has been gaining incredible momentum in recent years. Perhaps you've been wanting to try meditation but feel hesitant. This is understandable considering the fact that we place so much emphasis on producing more, and working more. We often hear from people comments such as, "I'd love to try meditation but I just can't find the time." You are the only one who knows whether meditation is right for you or why you are interested in trying it. Still, it's interesting to hear why someone might begin a meditation practice. • Stress or anxiety management -- Many people begin meditation as a means of managing stress or anxiety, and perhaps this is an even greater motivator for lawyers than for others, since stress is such a defining aspect of our professional lives. It's telling that both of us, the authors of this book, began meditating to manage stress-related issues. If stress is the reason for your beginning your meditation practice, welcome! You're in good company. • Increasing focus and productivity -- Our computers, laptops, phones, iPads, e-readers, and myriad other devices can make us more productive, but they also enable continual interruptions. These never-ending sources of distraction can leave us frayed and even undermine our fundamental ability to pay attention. Many professionals take up meditation as an antidote, to help navigate the disruption that is part of the modern working world without sacrificing their effectiveness. • Letting go of unwanted habits -- Meditation is often a crucial support for people who are giving up habits like smoking, overeating, or other behaviors that don't serve them well. • Dealing with difficult events -- Tragedy strikes all of us at one point or another, and its timing is not something we choose. Dealing with a sad event or a challenging time in one's life is often the catalyst for beginning a meditation practice. Meditation can feel right at this time, both because it can be calming and soothing and because it can help us connect with the deeper questions that can arise in these situations. • Seeking meaning and self-knowledge -- We all want to know why we're here and what our lives are about. This inquiry may come up as a need to understand our deeper purpose, or better define our values. Or we may feel we want to see reality more clearly, without the fog of neurosis and self-deception we suspect separates us from the world as it really is. This list is certainly not meant to be exhaustive. Beginning a meditation practice is personal to you; and whatever your own reasons for meditating, they should be honored. All are very valid reasons for meditating -- and meditation has a good track record with all of them. It's also possible the reason you meditate may change over time. You may begin a meditation practice to reduce stress or anxiety and increase concentration or focus; but with practice, you could find additional and perhaps deeper reasons to motivate your practice. Finally, remember, all of these benefits -- as impressive and welcome as they are -- are essentially side effects. It's important to bear in mind that meditation practice originally began as a means of transformation. Ultimately that is the most important thing meditation does, and the changes it brings are far more extensive than the health and self-improvement goals that up to now have been the main focus of scientific study. 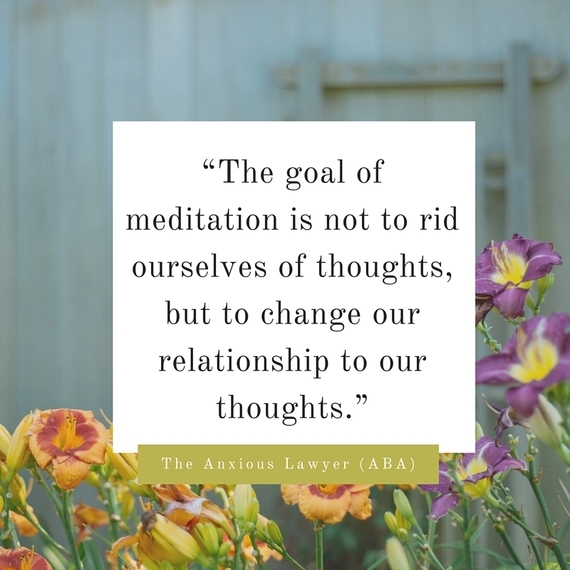 This article is adapted from The Anxious Lawyer: An 8-Week Guide to a Joyful and Satisfying Law Practice Through Mindfulness and Meditation, an imprint of Ankerwycke, trade imprint of ABA Publishing. Copyright © Jeena Cho and Karen Gifford, 2016.